Dominic Raab has come under fire for saying he “hadn’t quite understood” how reliant UK trade in goods is on the Dover-Calais crossing. The Brexit Secretary’s remarks came at a technology conference as he discussed the “bespoke arrangement” the UK sought with the EU after it leaves the bloc. Shadow Brexit minister Jenny Chapman suggested Mr Raab “doesn’t even understand the very basics of Brexit”. According to the Institute for Government, Dover is “a key artery for UK trade heading to continental Europe” with more than 2.5m heavy goods vehicles passing through the port every year. Its report says goods worth £119bn passed through the port in 2015, “representing around 17% of the UK’s entire trade in goods by value”. 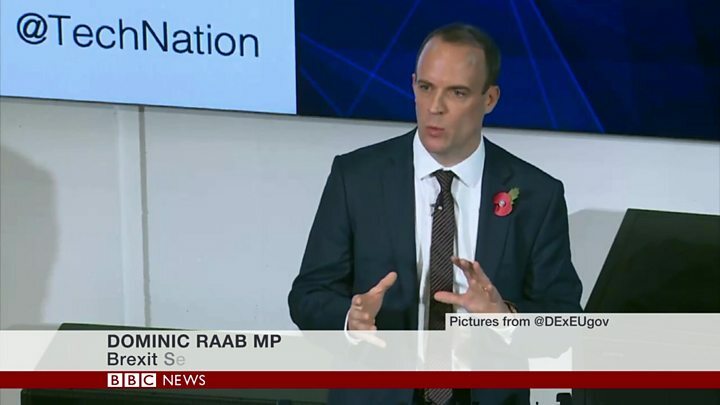 Mr Raab told a technology conference on Wednesday: “We want a bespoke arrangement in goods which recognises the peculiar, frankly, geographic, economic entity that is the United Kingdom. “We are, and I hadn’t quite understood the full extent of this, but if you look at the UK and if you look at how we trade in goods, we are particularly reliant on the Dover-Calais crossing. Reality Check: How important is Dover? Dover is indeed an important port for the UK. It is by far the biggest UK destination for roll-on roll-off ferries, handling 2.9 million lorries last year. Of the 120,000 cargo-carrying vessels that arrived in the UK in 2016, 13% of them came into Dover, writes Anthony Reuben. But that doesn’t make Dover the biggest freight-handling port. In fact last year it was only the ninth biggest by tonnage, handling 26.2 million tonnes, which is about 6% of the total amount of freight handled at UK ports. Those specialising in containers and other forms of bulk freight such as Grimsby & Immingham, London, Southampton and Liverpool handled considerably greater tonnage. Dover is vital for trade with Europe though, particularly for time-critical items. Its freight also tends to be high value, handling 17% of the UK trade in goods. Among critics seizing on the remarks, Will Straw – who was executive director of the Britain Stronger In Europe campaign during the 2016 referendum – suggested Mr Raab should have “done your homework before backing Leave”. The Freight Transport Association’s Pauline Bastidon said the group was “relieved to learn that the secretary of state for exiting the EU has finally recognised the importance of the Dover strait and frictionless trade for the UK economy”.